Heat gas or charcoal grill. Cut 4 (18x12-inch) sheets of heavy-duty foil. Spray with cooking spray. 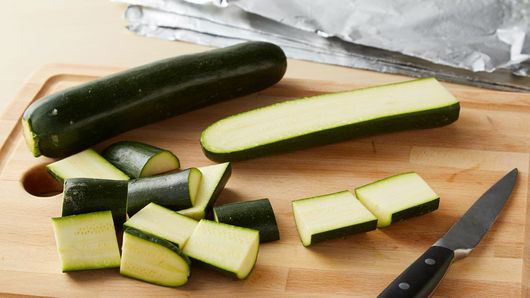 Cut zucchini in half lengthwise and again crosswise into 1 1/2-inch pieces. In small bowl, mix zucchini, thyme leaves, lemon peel and salt; toss to combine. 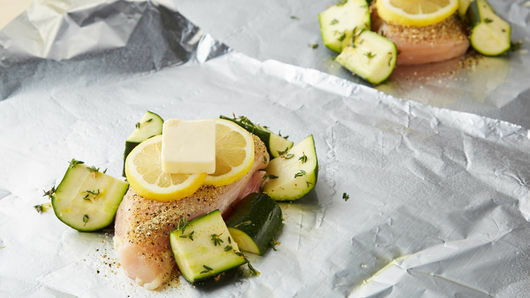 Place chicken breast on center of each sheet of foil; season with lemon pepper. Dividing evenly, spoon zucchini mixture around each chicken breast. Top each chicken breast with 2 lemon slices and 1 tablespoon butter. Place packs on grill over medium heat. Cover grill; cook 10 minutes. Rotate packs 1/2 turn; cook 9 to 10 minutes longer or until juice of chicken is clear when center of thickest part is cut (at least 165°F). Remove packs from grill. 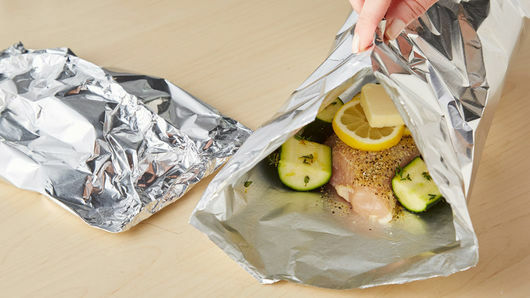 Carefully fold back foil, and garnish with shredded Parmesan cheese. To make in oven, place packs on cookie sheet. Bake at 375°F 29 to 33 minutes or until juice of chicken is clear when center of thickest part is cut (at least 165°F). 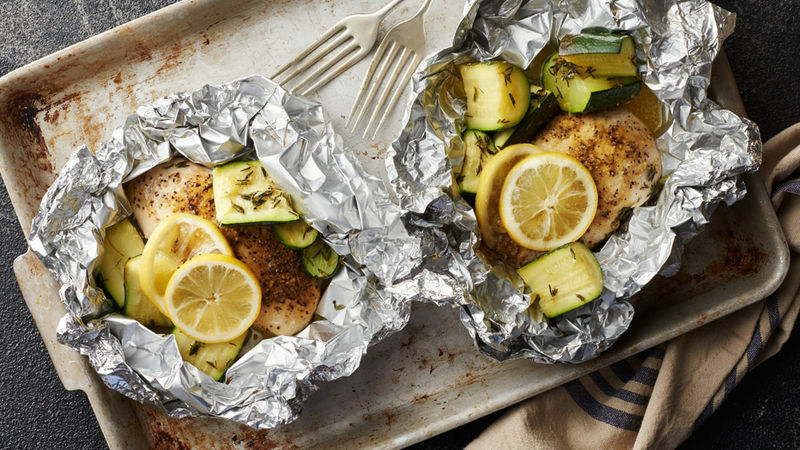 Yellow squash can also be substituted or added to the zucchini in the foil packs. Just be sure to adjust the total amount if using both vegetables, for example, 1/2 lb zucchini and 1/2 lb yellow squash. Zucchini and squash tend to water out when cooked. Serve these extra delicious juices with the cooked chicken and vegetables. Adding a side of cooked rice pilaf would be a great addition to this meal.